Nevermind about the selfishness of Bird’s character, the way he abandons his unloved wife after she’s given birth to a baby with a brain hernia. Nevermind about his four month drinking spree, which he spent completely inebriated after their wedding. Nevermind about him clinging to his girlfriend, Himiko, instead of waiting by his wife’s bedside, or baby’s incubator, in either hospital. This story, more about the father than his baby, is ultimately about growing up. Accepting responsibilities, disappointments, and the knowledge that there is very little in life we can control. No wonder it won the Nobel Prize for Literature in 1994. I will never forget it. I read this novel with the Nonstructured Reading Group, including Claire, Emily, Frances, Sarah, Iris and Richard. I am unlikely to forget this book too.Such a good idea to focus on this specific theme in the novel. It really shows Bird's growth. It is his growing up that made the novel for me. Ruthibelle, Africa is the dream of his heart: to visit, to adventure there, to get away. The novel doesn't contain much of Africa beyond that, but you can tell how significant it is to him. I haven't read Cry The Beloved Country, yet, but based on your recommendation I will. Thanks.Iris, absolutely. His growing up was the thing I kept reading, and hoping, for. If he hadn't, I probably would have thrown the book against a wall. Oe is on my 'authors to read' list – this sounds fascinating! JoAnn, this is the first work by Oe that I've ever read. I checked out his latest novel, The Changeling, from our library earlier this summer, but I returned it half finished. That is very unusual for me, being a compulsive reader to some degree, but I couldn't relate to the characters in that novel.This one, however, was very relevant to me. The issue of special needs children is faced by us on an every day basis at our school, even though that's very, very different from being a parent. His dream of Africa was definitely one of the most interesting and relatable aspects of him for me – I share his love for maps, for one thing! Bird is such an unusual character, since he makes it hard for you to like him, but at the same time you recognize that so many of his dark thoughts are things that may have passed through your own mind at various times. The fact that we don't act upon the majority of our own moments of dark thoughts is…fortunate, I guess. Even at his most despicable, Bird was relatable. Such a well crafted character! My, this is certainly one that looks like it may tug at the heartstrings a little bit. But, then again, I'm one to easily tear up when reading! This sounds amazing and quite a different sort of "growing up" then we normally read about, no? Great review, and I do enjoy the passages you select for your reviews. It's quite amazing the evolution of his perspective and the growth he experiences. Looking forward to reading it! Not to mention his nightmare about being chased by the African wart-hog whose Japanese name he can't remember! Talk about alienation from one's own culture.I agree that this book was so well-crafted – particularly gripping & involving considering its short length. Sarah, as much as I hate to admit it, I do recognize some of his dark thoughts as flitting through my own mind. Like you said, it's good we don't choose to act on them! I think he pulled his life together in the nick of time. Before all was lost, and nothing but regret could set in.Coffee and a Book Chick, I'm glad you enjoy the passages I pull. In this particular case, I felt they really showed the evolution that our 'hero' underwent. Books often make me cry, too, touching on our softest spots just as much (or more so?) as film.Emily, you always pull out things from novels that I fail to recognize the first time through. Alienation from one's own culture is clearly evident, but all the more so when you mention the warthog incident. A perfect epitome of the situation he was in. Or, created? Your last line – "I will never forget it" – says so much to me. I'm adding this to my wish list. Interesting. I read Rouse Up. . ., which also dealt with Oe's relationship to his disabled son. He talked quite a bit about his other books, including A Personal Matter, but he never mentioned Africa at all. This one has never even been on my radar screen. It sounds wonderful. I'm adding it to my list. Bermudaonion, it's short, but it packs a very powerful punch. Plus, I love knowing what the Nobel Prize winners for literature consist of.E.L. Fay, now you have me wondering about Oe's personal life; it sounds as though he has a disabled son of his own from your comment, which I didn't know. That would make this novel all the more outstanding.Kathleen, that happens to me all the time: coming across books I'd never even heard of! Bellezza, like Iris, I think it was cool that you focused on the Africa thread running throughout the novel. However, I didn't really see Bird as "evolving" myself–or at least, I didn't buy that his character had suddenly grown up at the end because I didn't believe Oë was credible by that point (he waited till the last two pages to wrap up an awful lot of loose ends). Anyway, I seem to be alone in my dislike of Oë's writing style so far, so I'll merely thank you for reading along with the group again and remind you that I haven't forgotten about reading something for your Japanese Literature Challenge at some point (hopefully, something I can rave about). A presto! Richard, there is no hurry for the Japanese Literature Challenge. It doesn't end until January 30,2011 which gives you lots of time to read, and hopefully rave about 😉 something wonderful. I'll be so interested to see what you choose.Didn't you find that some of Oe's sentences were very powerful? I thought that they were clear and forceful standing alone; perhaps it was more of the whole which you objected to. I agree; it all ended rather suddenly.Still, the concept of parenting a special needs child is quite a daunting one, and I'd imagine that this book would bring up a lot of emotion should participants be able to discuss it in a room together. I wanted to read this book together with Claire and the rest as well, and actually did pick the book up about a week or so ago. But for some odd reason, I never managed to get past page 20, and sadly, I put the book down for another.So, I haven't yet read your review, but I'm meaning to read it some time soon. Maybe I just wasn't in the right frame of mind then..
Love this Africa thread here. Thought it interesting that Bird was so fixated on the continent that he knows is in a constant state of flux. Like when in the beginning he buys the road maps because he knows that geopolitcal situations will shift but the roadways will remain the same. Speaks a lot to the post-war themes that Emily treated so well.Ultimately though, this book just did not work for me – neither the language nor the ending. Bummer. Thanks for joining in the read though and sharing your great Africa insights. I haven't read this, but you made me want to. Africa–about as far from Japan as one could get. Bird's hopes and dreams all pinned there. Maturity. Emily's idea of alienation from his own culture. Yes, I think I'll have to find this one. Thank you. Thank you on the kind comments Bellezza. 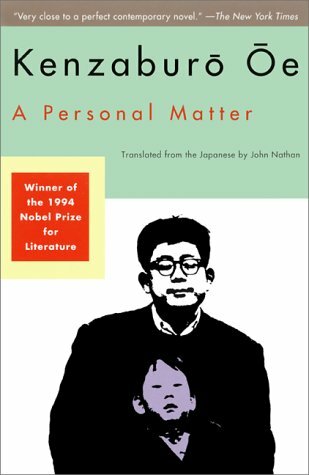 xI saw this book and I was jumping on my heels when I first saw the shelf full of Japanese written novels.I am buying this next. The last sentence just persuaded me to. Bellezza.. I really love how you focused on Africa too! These were bits I enjoyed about the novel, his dreams. ALthough I really felt disconnected with Bird, because I had a similar experience with my second son but our feelings toward it could not be anymore different! He was thinking about how his dreams would be unrealized, he was thinking about himself. While I was thinking about my son's life, his own dreams, etc, and not about myself. Claire, your comment pierces my heart. Is your son well now? If he has learning problems, or another difficulty, you would be the best mother to have. You're so compassionate, and able to focus on what's real and important. I know you would not have any of Bird in you; he seems more like an American teenager of today than a Japanese young man in his twenties. Not read this one, but have read-The silent cry. Took a while to get into it,some books on introduction you get straight away,others its more formal,you need to work at the relationship. I found with the -Silent cry, it took a while before the bond with the book was formed.